Offering you a complete choice of products which include razor wire, razor clip mesh, concertina coils, flat panel razor coil, razor mobile barrier and sensor coil fencing wire. 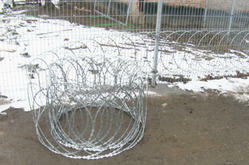 Maimoon Razor Wire is manufactured from 2.5mm diameter. It is made up of high tensile spring steel wire of tensile - 1500 MPA around which is razor sharp barb of 0.50mm steel strips are cold clenched. Maimoon Razor Wire is manufactured as per ASTM: F 1379-95. The range of razor wire is available in short medium & long blade as in Concertina coil. It is used in Flat Wrap & Single Strand form for high security fences for military installations & other top security units. For more details, Kindly refer to the PDF attached. Punched Tape: 0.4 - 0.6 Galvanized Steel Sheet. Steel Core Wire: 2.55mm dia Hot Dip Galvanized Spring Steel Wire. Mesh Size: 150mm*150mm (_ 15). Short Barb in available size. Medium Barb available in size. 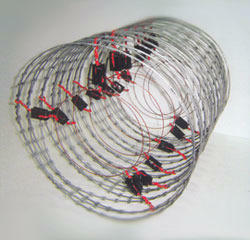 Razor wire Barbed tape is clipped round the circumference to form a helix of concertina coils. The concertina coils are assembled in different dimensions to form 300mm - 1500mm diameter wall top or ground level barriers. It is available in Short barb, medium barb, scrapper barb, long barb, axe barb versions. 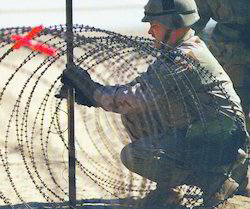 BSMW flat wrap screens are fabricated from high tensile razor wire to form a flat panel formation. It increases the effectiveness of Existing Fencing. It can fitted on welded melt fences, chain link fences, barbed wire fences, wall tops and ground level to increase security of the perimeter area and make it difficult to penetrate. Installation of flat wrap fence is very simple when it is used as an overlap on an existing fenced area to increase the security of the zone. It is fitted by overlapping the fence mesh as shown with special clip accessories. It is made up of carbon steel strips having a series of sharp barb. This range is made with two 600mm diameter coils as base and one 1000mm diameter coil on top. The Barriers comes in compressed package of 12-50 meters length as per required. The system detects intruding attempts and alarms with a loud siren and flood lights. The system operates even when the supply line is out and the energizer produces harmless shock of 5 volts and is non lethal. The system is extremely rugged and operates under all weather conditions.